When faced with serious or life-changing legal issues, it is crucial to partner with an experienced law firm, one that is committed to a best possible outcome for your unique circumstances. Since 1990, we at THE OFFICES OF THOMAS W. STOREY, APLC, have been working in and around the city of El Centro and the greater Imperial County area in California to help clients deal with difficult legal issues and get back to their lives. 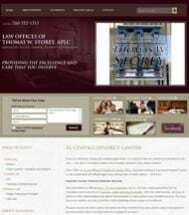 We at THE OFFICES OF THOMAS W. STOREY, APLC, understand the difficulties that family, civil and criminal issues can pose. We also have a deep appreciation for the importance behind decisions in business, estate planning and probate. Because of this understanding, we provide personal and direct representation and upfront communication to work toward an ideal outcome. We know that a true solution can only come from a total knowledge of you, your family or your business' unique situation. Our law firm has tried hundreds of trials to verdict, giving us a total understanding of the courtroom and the investigation needed to arrive at the best possible outcome. Our lawyers' thought leadership and experience are exceeded by their tireless commitment to your success. We offer free initial consultations on all cases and offer discounts to military and law enforcement personnel. We encourage you to reach out.